Are You Wondering What's Next? It may be difficult to stay positive, keep smiling, and to keep your eyes wide open to all the possibilities and ways in which you can create the life of abundance, freedom and choice you deserve. You'll need a reminder of how to stay in ABUNDANCE. And your copy of The Abundance Code is that reminder! Share it with your friends and loved ones so you can help others shift too and start to create a supportive community of like-minded people around you. You'll get the film in both High definition and Standard definition so you can watch it anywhere, anytime, on your TV screen, monitor, projector or your mobile device or tablet! In addition you get the audio version of the whole film which is amazing to take with you in the car, on walks or anytime you want to listen to the content of the film while on the go. 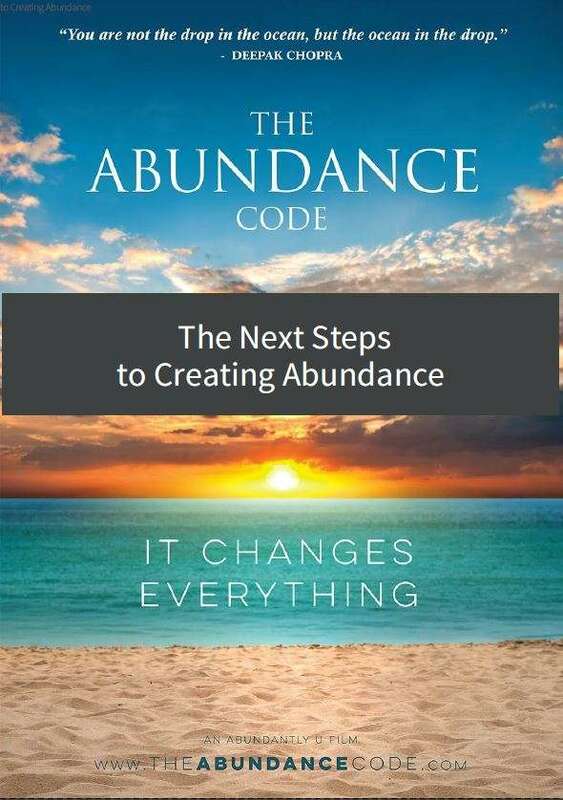 The Abundance Code ​Companion eBook is a great tool to use while watching the film for the first time or additional times to highlight key learnings and action items. Put The Abundance Code Into Action In Your Life! Today! Most of the footage we shot in the expert interviews for The Abundance Code couldn't actually be featured in the film. We literally had about 40 hours of footage which we compressed down into a 90 minute film. That means over 95% of the content we shot was left out of the film! There are still tons of amazing insights and practical tips for creating more abundance in your life from the experts you came to know and love in The Abundance Code film. The Masterclass series is where you discover how to over-write your beliefs in scarcity and really turbo charge your mindset for abundance and success. This series takes The Abundance Code to a much deeper and more profound level with 11 custom designed step-by-step video classes and an accompanying workbook. . With 3+ hours of content that has been organised into easy-to-digest topics for you, you can continue your journey into abundance! Step #1: Seeing the Roots of Scarcity Thinking Join our experts as they explore how and why scarcity thinking gets embedded in our subconscious programming from an early age. With any personal development or change, awareness is the first step. This Masterclass will shine a bright light of awareness on the root of the problem. Step #2: Stopping Scarcity and Dis-Ease Scarcity thinking leads to fear, tension, stress… and ultimately dysfunction and disease. Discover how you can stop Scarcity thinking in its tracks, to avoid burn-out and stress-related illnesses, and change your mind to create a life of health, wealth and prosperity. Step #3: Breaking Free from Scarcity Part 1 Actively and consciously choose your beliefs so that you can break free from Scarcity and create real and lasting change in your life. Discover the keys to creating the kind of life your truly want, filled with purpose, a deeper connection to yourself and to others, and live your life in alignment with your highest values. Embrace YOU! Step #4: Breaking Free From Scarcity Part 2 Take your visualisation and manifestation techniques to the next level in this Masterclass. Discover how a few simple tweaks to your process can turbo charge your results in creating the life your truly desire. Step #5: Moving from Competition to Cooperation The drive to compete actually keeps us locked in to a system that feeds on itself. Jealousy, envy, constant comparing and measuring lead inexorably to the feeling of ‘not enough’. Discover a better way, a way that honours your unique gifts and allows you to collaborate, create, and have more fun... all while accessing greater abundance and prosperity in your life. Step #6: Dealing with Distractions Distractions stop you from being the best version of YOU that you can be. It’s that simple. And yet, they are often so seductive and pervasive… discover how to deal with distractions, addictions and obsessions. Kick them to the curb, and access your authentic creative potential to be abundant and do extraordinary things in life. Step #7: Powering Up with Community and Masterminds No one is an island. Together we can do so much more… faster, better, and with a greater sense of connection, meaning and fullfillment. However, not everyone in the world will lift you up or inspire you to be your best self. Discover how to create community with like-minded people who will turbo charge your progress to abundance, and how to have clear boundaries with those who might not be supporting your growth. Step #8: The Quest – Your Path, Your Journey – Part 1 Everyone has a unique path to follow. Your path and my path are not the same. Discover how to get clear on what YOUR unique path is, and how you can step out of the fear mode, open up to possibility and access your true sense of purpose. Step #9: The Quest – Your Path, Your Journey Part 2 Step into your own authentic life where you're smiling more often than you're not, you're happy more often than you're sad, you can't wait to get up in the morning, and you're surrounded by people and influences that fill your heart with gratitude. Claim your true power and create a life that you love living every day… you have something unique and amazing to offer to the world. Everyone does. Discover how to dig down, deep inside yourself, and find your unique mission and purpose. Step #10: What is Abundance? What is YOUR abundance? Not anyone else’s… What is the true life of abundance YOU really want to create? What does it look like? How can you get clarity on that? This masterclass will help you find the answers. Step #11: How Giving Back, Gives Back Having an impact, a positive impact on others with something you say, something you teach, or something you give or do… even just a look or a smile… is incredibly rewarding. Giving back gives back. Our experts share how giving back can transform you, your community and your life so that you can experience more abundance, joy and meaning every single day. Option 3: Access THE FILM PACK and THE JOURNEY PACK AND THE EXPERT ACTION PACK with The Total Abundance Pack! EVERYTHING you need to kick-start positive change in your daily life, and turbo-charge your own journey of abundance. Let one of the world's top experts in visualisation & transformational mindset practices show you how to super-charge your abundant transformation of body, mind and spirit... anywhere, any time! This bonus includes 4 Audio Visualisation MP3s PLUS a 5 video Series to take it all to the next level. JB Glossinger gives you the Motivation you need to stay on track and improving your life, bit by bit, day by day. Incremental improvements, that's the key! JB knows exactly how to keep you out of overwhelm and in a state of positive action. These audio coaching sessions, of about 15 minutes each, are the perfect bite-sized daily dose of inspiration, practical techniques and ways to implement incremental positive change in your life, to keep you focused and achieving steady progress in your journey to more abundance! In this incredibly informative and enlightening webinar series, Ruth Buczynski PhD has brought together some of the greatest minds on this planet with respect to mindfulness and meditation. You'll discover the latest cutting-edge techniques to increase your mental focus, and overcome conditions like chronic anxiety and fatigue. Discover the quickest, most scientifically proven ways to boost your energy, increase your daily mental performance and reduce stress in your life. Let Victoria Labalme show you how to make the most of your creative abilities. She can help you tap into creative talents you didn't even know you had, and express yourself fully in all you do. Access recordings of some of most popular talks of the premier personal development summit in the world, the Hay House World Summit. These 4 x 1-hour audio lessons are not currently available anywhere else! Kathleen Bloom was not in The Abundance Code Film, though she is featured in the Masterclasses. Why? Simply because what she has to teach us is so DEEP, and so much about tuning in to our inner knowing that we simply couldn't do her topic justice in the film. There wasn't enough time. So now, you're in for a real treat! Kathleen has some wonderful practical exercises and meditations designed to help you tap into 'that voice' - the voice inside you that knows exactly what your next step should be. Kathleen will show you how to listen to that voice and how to be guided every day, in every decision you make, by your perfect inner compass and knowing. Join Like-Minded People And Put The Abundance Code Into Action In Your Life… The Abundance Code Activation Facebook Group is FREE with EVERY Purchase! You never know when the right time, the right message from the right person will come along. This may be it.